During a conversation with collector Lauren Kruse at an art opening at the Gemini Gallery in New York City this winter, I was struck by her strong, life-changing response to an artwork she had recently bought for her home. As an artist, I wanted to know more about it. Anne Sherwood Pundyk: To begin, please tell me a little bit about yourself. Lauren Kruse: I am a professional; I work for a retailer in the real estate and construction industry. When I went to school I studied art, among other subjects, but over the last 15 years, I really have not stayed up on the art world. So, it was a nice surprise when I met Emily Santangelo, of Emily Fine Art. She reintroduced me to contemporary art. When she invited me to see a gallery exhibition and I thought, “This is something I used to be very involved with and I think I might like to revisit it.” So, I realized I wanted to reenter the art world. It felt like I was seeing it with different eyes compared to when I was younger. I didn’t really know what to expect when I walked in to the show. I thought there were some interesting art works, but nothing really resonated with me until I came upon the piece that I ended up buying. It is a painting called “Chamonix L'ete,” by Kate Carey. When I saw that piece I felt an immediate attraction. Actually, my sister-in-law, Cathy Kruze, first saw the piece. It was not in the main room with all the other art works – it was in the hallway. Cathy pulled me out into the hall and said, “You have to see this piece.” She was thinking about it for herself, but I said, “No. No. That will go perfectly in my house!” So, there was this little battle over it at first. ASP: That’s a common experience when looking at art, I believe: both the strong reaction and then noticing that others are responding to the work, too. It is gratifying to have a piece you like be desirable by others. I wanted to ask you about how your first experiences with art laid the foundation for your more recent responses. LK: I feel that I connect to it a little bit more now that I am older. When I was younger I didn’t really relate to any type of modern art. I got into what I do for a living because I really like architecture. But contemporary artwork, such as paintings and sculpture didn’t resonate for me. Now I am more open to it. ASP: I love that art can be a marker for how we see ourselves and how we understand ourselves over time. ASP: Describe what attracted you to the painting you bought. LK: What drew me to it were the colors. They are just perfect to me. It is very serene, yet it has a lot of movement in it. There is a layer of white and beige paint gestures forming a screen through which you see many other colors such as peach, turquoise, pink, green and yellow. This effect creates many shades of each of these colors. ASP: Tell me about the movement. 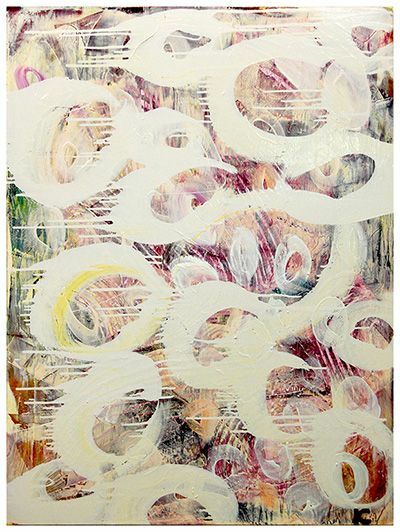 LK: The movement comes from the white paint, which creates swirls, and the swirls drip. The picture hangs vertically, but unexpectedly, the drips run horizontally. It looks as if it was actually painted in the opposite direction from which it was meant to hang. ASP: So it appears to defy gravity. LK: Exactly. And because of that it captures your attention. I think I mentioned to you when we first spoke that I do yoga in the room where the painting is now hanging. I used to face the opposite wall, which has windows looking outside. I now face the painting because I find it so serene and so easy to fall into. It is a place for my concentration to go during my yoga practice. It satisfies me. I don’t ever loose my attention. I can stay there and constantly go back to it. There is an important part in yoga where you need a place for your steady third eye to be and I can always find it in this painting. ASP: You have come back to art by acquiring this painting and putting it in your home. As a result, do you find that you think about art differently? LK: I absolutely do. Before, art was something you put on the walls. If you had a big wall you went to Homegoods and you found something that “matched” and you put it on the wall. Now it’s more about just falling in love with something and knowing you can live with it forever. You are not going to get tired of it. Instead of fading into the background it becomes a part of your space. ASP: Does it feel more like it’s a living entity or presence? LK: It’s like a presence or a character. It is more than an object. ASP: It has a life. LK: With something you put up to cover the wall, there comes a day when you get tired of it. When you fall in love with a piece of art, you are never going to do that. I am never going to take this painting off the wall and throw it out. It will always be with me now. ASP: Do you look for other opportunities now to see art? At galleries or museums? LK: Yes, it its interesting. All of a sudden you find yourself wrapped up in it – in the middle of it. ASP: So art has become something that you feel is important and it has shifted in its place in your life. LK: Yes, I also wanted to say that I think I had a preconceived idea about the people that were in the art world in New York. I have found it was really nice to meet people and they did not meet the expectation I had of them. Everyone was very warm and very open and willing to talk about art. I found that really refreshing. It was a surprise. ASP: The art world, especially in New York, can be imposing. There is so much to see and read. It can be overwhelming. There is so much to know; it is impossible to know everything. You can certainly become versed in artist’s work, or a piece of history or a gallery program, but when it comes down to it when two people are standing side by side looking at a piece of artwork each of their opinions about the work is as valid as the next. LK: I didn’t expect that that would be the case with most people in the art world. I probably wasn’t being fair; it was a prejudice I had. It was really nice to know there was no validity to it. Or if it is out there, I haven’t experienced it. ASP: I am happy for you, because it is an enriching experience to engage with art. I think for you to be aware and open to that and participating in the art world is great. It enhances life.